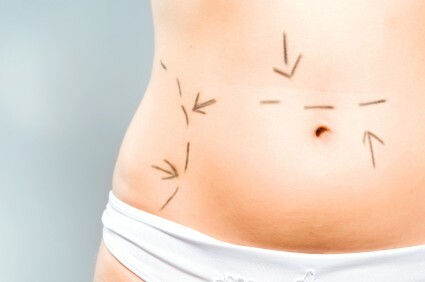 There are a number of reasons why someone may wish to have a tummy tuck procedure performed. Tummy tucks are also known by the medical term “abdominoplasty”. Tummy tucks are usually received by women who have had children or have lost a large amount of weight but may be received by men as well. This cosmetic surgical procedure has many possible benefits including elimination of sagging skin, removal of an abdominal “pouch”, repositioning of the navel and repair of weakened abdominal muscles. Conditions such as pregnancy and obesity can stretch the skin of the abdomen beyond its normal limits. In addition, as we age the skin loses some of its natural elasticity and may not return to pre-pregnancy or pre weight gain appearance. This can result in large amounts of hanging skin around the abdomen. Some people also develop and abdominal pouch that hangs down in front of the pubic section. The folds of sagging skin are not only an embarrassing problem; they may also contribute to the development of fungal and bacterial infections underneath the pouch. Stretch marks are often prevalent on the lower abdomen where the skin is sagging. A tummy tuck procedure, involving surgical removal of the extra skin and tissue can eliminate these problems. When the stomach skin has been stretched and has not returned to normal, the belly button or navel may appear to have “fallen”. For those who need it, after the excess skin is removed the navel can be surgically repositioned and raised to a normal level. This will result in a natural, youthful appearance of a smooth abdomen. Many people who get tummy tuck procedures can return to wearing abdominal baring apparel such as bathing suits without embarrassment. During pregnancy and through excessive weight gain, abdominal muscles may be separated and weakened. They may not return to normal, resulting in a permanent abdominal bulge. During an abdominoplasty, the cosmetic surgeon can restore the natural shaping of a flat abdomen by surgical strengthening of the muscles. This will contour the abdomen into a youthful flat appearance. Some patients have less skin to be removed or may only need to have the abdominal muscles strengthened. Some women have skin with more natural elasticity and have only a little pouch. A mini tummy tuck can remove the small amount of skin and fat tissue with only a small incision at the top of the pubic hairline. Endoscopic tummy tuck procedure may repair the abdominal muscles with only a few small incisions for those who don’t need to have any skin removed but still have an abdominal bulge from weakened muscles. Removal of excess skin and contouring of the abdomen will improve the appearance of the stomach and may even allow one to return to wearing a bikini or other belly baring clothing. Tummy tuck procedures may dramatically improve appearance and increase self esteem as one feels better about the body and can even promote improved health by allowing one to feel more capable of physical activity.